Meakusma and Amer Lab. 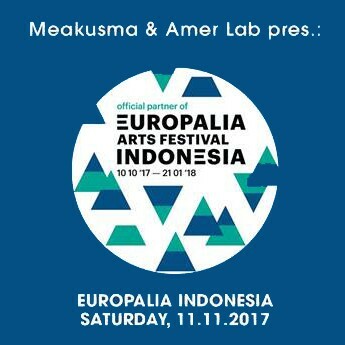 are proud to present an evening of music in the framework of the international art festival Europalia which has Indonesia as its focal point this year. First there will be five concerts combining traditional influences with modern developments from east and west. Proceedings will then be rounded off by DJ sets that take that global sound to the dancefloor. The concert part of the evening features a unique performance by legendary ambient composer and performer Laraaij together with Carlos Niño, a central figure in contemporary experimental music in Los Angeles. There will furthermore be live performances by Indonesian composer Otto Sidharta, a specially commissioned performance by Lebanese producer and DJ Rabih Beaini together with Bandung duo Tarawangsawelas, DJ and producer Wolf Müller from Düsseldorf and composer Richard Youngs. Djs Dea Barandana from Jakarta and Steele Bonus from Australia will translate the idiosyncratic and oftentimes exotic vibe of the evening to the dancefloor.